The apple, it is said, doesn’t fall far from the tree. As a saying, it’s used to indicate that traits we see in the younger folks can often be traced back to the older folks of their family. If little Johnny is a bit of a hellraiser, well, just look at his Dad when he was a boy. If Susie is a bit of a flirt, well, just remember what her mama was like as a girl. He was still in the Army in 1920 when he was enumerated at Camp Zachary Taylor, Kentucky, as 27-year-old Gilbert F. “Cotterall”, a sergeant in the United States Army, born TX.8 The camp was a military training camp that opened in 1917 to train soldiers for U.S. involvement in World War I. It was closed three years later. There’s not a shred of evidence that Bert ever divorced Myrtie. So what does this have to do with apples and trees? Well, I’m putting together this talk for the Federation of Genealogical Societies Conference in San Antonio, coming up in August. The title is That Scoundrel George. It’s about Bert’s grandfather, my second great grandfather, George Washington Cottrell. The one who qualifies me for membership in the Daughters of the Republic of Texas. And I can sure prove George was a resident of the Republic of Texas. I can prove he was indicted by the Republic of Texas. What a wonderful, if sad, story, Judy! Sometimes it amazes me how many people I know find bigamy in their family trees. I haven’t found it yet, but maybe I’m simply not looking hard enough. I do have the feeling that there was a time when divorce was such a scandal that it was simply easier to “put her on the train back to her family” when things turned sour than to go through the difficult legal process of getting a divorce. Then if somebody turned up that you really did want to marry, why, just go ahead. In a way, Bertie’s father had paved the way for this behavior, since you don’t say his parents divorced, just that they separated. Does that mean his father deserted the family, or do you know? If Bert had been married to Myrtie for 10 years, and divorced her, both women could have collected on his Social Security. At least that’s how the law works now. My ex has been married to three women, including me, for that length of time by now–that I’m aware of. Maybe more; I’ve lost track of him. I’ve earned more on my own than I would get by collecting through him, but I’m entitled to do it that way. I don’t know if he’s aware that that’s how the law reads, but if he is, I suspect he wouldn’t be pleased! At the time, only one wife could collect — and that ended up being Hertha. The other woman never remarried. In a way, what Bert doesn’t so much count as bigamy in my mind than neglect of legal details. It was clear the marriage was over. To me, “real” bigamy is when a man or woman keeps two or more spouses at the same time, with neither knowing of the other. That involves deception. What I have a little trouble coming to terms with is being descended from several lines of people who practiced what was known as plural marriage. A bit beyong polygamy, because there were many instances in which an alpha male (so to speak) fancied the wife of another man, and married her. She often would end up returning to her original husband. And there is one case in my family’s ancestors where we don’t know which children belonged to which of five wivee. Fun. Why did they put up with it? It wasn’t in part of the deal when the first marriage took place. And then there’s my 2nd great grandfather, John Marion Renfro, at least six wives, one known divorce. Why? Thanks for the post, Judy. Oh my… What fun tracking HIM down! Your article caught my eye, as my mother’s maiden name was Cottrell. However, all of her family was from West Virginia. Does your Cottrell line trace back to West Virginia as well? There’s a joke in our family that if you meet a Cottrell, you’re going to be related to him. So far, that’s been the case! Very interesting article, by the way. It’s humorous the stories we fine while research our trees! The Virginia Cottrells, descended from Richard of New Kent and Henrico, are my line and they are not related to the West Virginia Cottrells out of what was Harrison and later was Kanawha and Lewis. But my brother-in-law is related by marriage to that WVA crowd! 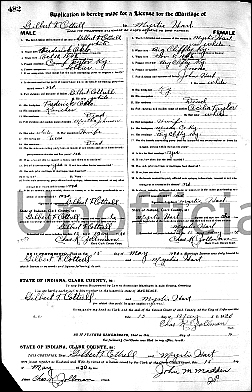 I love that he was recorded as a girl in the 1900 census. My father-in-law, Harry, was recorded as a girl, Hattie, in the 1930 census. When I told him this, he imitated his Hungarian-born mother saying his name, which would have sounded like Hattie to a census-taker unfamiliar with her accent! That’s a wonderful story, and oh yeah… you can just see how it happened!